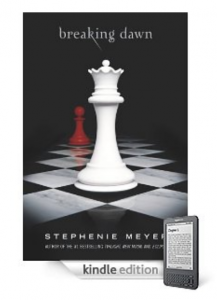 At last, we reach the final installment of the Twilight series for the Kindle: Breaking Dawn. Bella and Edward get married, and we hear a good bit of the story from Jacob’s point of view. It appears that Breaking Dawn was written for a more mature audience considering the more graphic depictions of certain events in the novel. The reviews for Breaking Dawn were all over the place. Some say it is the worst book in the whole series, and others say it is awesome. So, it really is just a matter of personal preference I guess. Here is a review that pointed out an issue that was brought up multiple times in other posts, which is the fact that about half of Breaking Dawn was written from Jacob’s perspective instead of Bella’s. This reviewer brought up a good point. This series is meant to be fiction, and often in life, things don’t turn out the way we want them to, but fiction gives us a means of escape. It also fuels our imagination. So for those of you who have read Breaking Dawn, do you think it provided a good ending for the series? If not, what would you change about the ending? This entry was posted in Good Kindle Books At A Glance, NYT Best Sellers and tagged Breaking Dawn, romance, Stephenie Meyer, Twilight saga, vampires, werewolves, young adult fiction by holly. Bookmark the permalink.